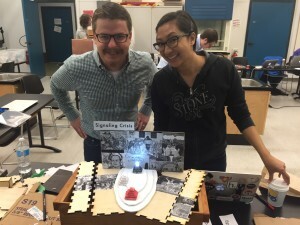 In the DHSI Physical Computing class, Anne Cong-Huyen (Whittier College), Devin Becker (University of Idaho), and I created a project we titled “Signaling Crisis” for our end of week prototype. This project was a true collaboration; everyone contributed to the ideas, code, and design. It’s also art. Political art. I’m usually an analysis person (not a creative person), so this project was a stretch, and in a good way. Huge huge thanks to Jentery Sayers, Katherine Goertz, Tiffany Chan, and Danielle Morgan of the University of Victoria Maker Lab for such an amazing experience. “Signaling Crisis” by Anne Cong-Huyen, Devin Becker, Caroline T. Schroeder. Installation at the DHSI exhibition of course projects 17 June 2016. This piece was inspired by the depth of crisis currently in Egypt. The Great Pyramids of Giza are a near universally recognized symbol for Egypt. Our pyramids are colored red, white, and black — the colors of the Egyptian flag, symbolizing the current Egyptian state. They signify Egypt’s history and also its contemporary tourism industry, so key to the country’s economic development and its people’s economic wellbeing. A light on the top of the black pyramid blinks out “S.O.S.” in morse code, while the pyramids are surrounded by reproductions of political graffiti and street art in Cairo dating from the January 25, 2011 Revolution to now. The graffiti critiques the state under Mubarak, Morsi, and Sisi. It also reflects a few different aspects of the crises — political, economic, social. A photocell on the top of the red pyramid detects the ambient light in the space, and the LED blinks at a rate corresponding to the amount of light in the room. If you occlude the light, the SOS blinks faster, signaling the increasing urgency of the message as the ambient light gets darker. We chose light as the measure for speed of the message in part because the Giza Pyramids line up with the path of the sun. The four sides of each pyramid align with the four cardinal directions. The pyramids themselves “face” east, toward the rising sun, symbolizing birth and the beginning of life; the temples and Sphinx are on the East side. The sun sets behind them in the West, in the direction symbolizing death, burial, and the afterlife. Ancient Egyptians probably saw the pyramids’ sides as symbolizing petrified sun rays pointing to the sky and the domain of the sun god. I have ambivalent feelings about fabricating and remixing Egyptian antiquities. I hope this installation puts the focus back on Egypt and present day living Egyptians, rather than on the pleasures of digital fabrication and the commodification of antiquities. I hope that interacting with the exhibit (dimming the light) led people at DHSI to think more about what is happening there, and perhaps by interacting even thinking about their relationship to Egypt, America’s relationship, even our complicity in the situation. I learned so much from working with Anne and Devin. Thank you for your inspiration and collaboration. This statement reflects only my views and interpretations of a joint project. It took some time to brainstorm the project and generate an idea. Initially we thought about having our project emit sound as well as light, but ultimately decided simpler would be more effective and more likely to be successful. We built our project around the Giza Plateau prototype I created in class on Tuesday. 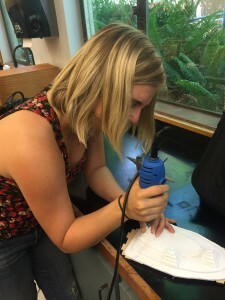 Our course instructor Kat drilled holes through the tops of two pyramids so we could insert an LED light to emit the SOS signal and a photocell to measure the ambient light. 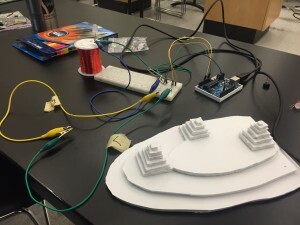 We prototyped the circuit on an Arduino and breadboard and developed the code before putting the circuit in our pyramids. 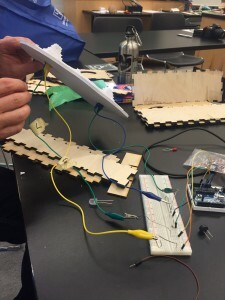 We used an Arduino board and code written in the Arduino software app to run the program. 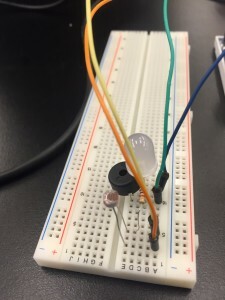 We took existing Arduino code that sends a continuous SOS in Morse Code through the LED (…—…). The LED blinks more briefly for dots and longer for dashes. We added a variable for the input of light from the photocell and multiplied that number by the delay for the light to blink and also for the pauses between the dots/dashes and the pause between the repetitions of the word SOS. Thus the entire message blinked faster as the light reaching the photocell dimmed. Devin was particularly essential member of the team when it came to writing the code, though all of us participated. Once we got the circuit working on the board, we had to get it into the pyramid. I carved out (excavated? gutted?) the underside of the two pyramids so we could connect the wires to the legs of the LED and photocell. We wired them using alligator clips back to the board. Finally we finished the artistic installation. Anne had the inspiration to paint the pyramids the colors of the Egyptian flag and to include reproductions of Egyptian graffiti from the January 25 revolution and subsequent protests in the years since. We tried to find graffiti that spanned the 2011 revolution, Morsi era, and now Sisi era. Finally we put it all together and installed it at the DHSI end-of-week exhibit of projects. I found it surprisingly fun and rewarding to watch people interact with the installation. 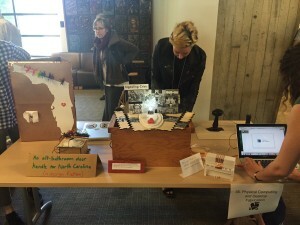 Other folks in the class also exhibited incredible projects. Check out #DHSI2016 and #physcomp on Twitter to see pictures of them. This post was originally published in the morning on 17 June 2016 with bare bones information of the participants in the project, Arduino code, and website sources for the graffiti. I modified and expanded it later in the afternoon after the projects were revealed at the DHSI Friday lunch and exhibit. 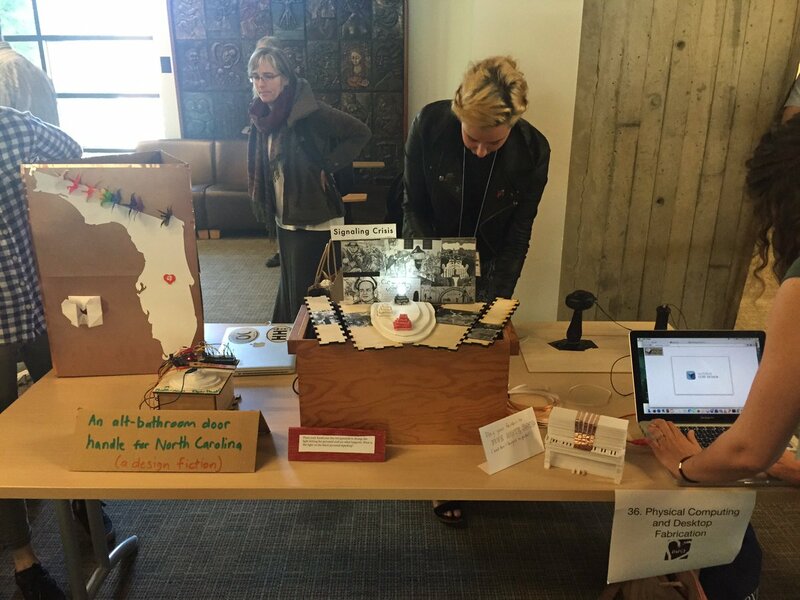 This entry was posted in DHSI, Digital Humanities and tagged 3D reconstruction, cultural heritage, digital humanities, Egypt, materiality, open access. Bookmark the permalink.